The Syrian civil war has proven nothing short of confounding. Its complexity is a function of intervention by the major regional actors in the Middle East and as well as other great powers. The Assad regime is supported by Iran and Russia while Turkey and the Arab states led by Saudi Arabia support the rebels. Yet cooperation among Assad’s patrons is more robust compared to those of Syrian’s rebels, which have been limited among Sunni regional powers. And then there’s the United States, which wants to support someone as an adversary of ISIS but cannot find Sunni proxies with an interest in the same threat. Given the wide range of perspectives of how the war might progress and the appropriate US policy (much of which the war has proven wrong), studying these relationships between actors inside and outside Syria might offer a better way to think about its trajectory and potential outcomes. And lots of recent research in IR on imperial structures and insurgent organization does this, especially Daniel Nexon and Paul Staniland, which they call a relational-institutional or social-institutional approach that studies social ties and broader network structures. In particular, this approach would suggest that properties of network configurations might determine who is winning and losing in different phases of the war. A grain of salt: what follows below is a speculative and informal application of one particular network concept, certainly a real historical analysis would be much more rigorous (and hey, this is a blog, so here goes). One important property is network density, a concept which refers to the ratio of the number of possible ties between different actors and the number actual ties. Depending on this ratio, a network will be either sparse (few ties) or dense (many or all ties). Network density in the Syrian civil war would refer to all the possible ties spanning external sponsors and domestic combatants. Density is theoretically relevant because actors define themselves and represent their own boundaries in relation to others. When those relations are mutually congruent among all actors, each has a more stable identity that serves as a basis for stronger organizational capabilities. If all actors have strong relations with each other, each has a stronger identity. Domestic combatants embedded in cliques of cooperative external sponsors, a structure in which where each actor has ties to others in the network, will be stronger because that network has a higher density. In other words, combatant cohesion and coordination depends on the degree of cooperation among its external sponsors, and density is how we can conceptualize that structure of cooperation. If true, then the network density of great power sponsors should be a major factor in driving the trajectory of the Syrian civil war. We can make a crude representation of this by charting some relationships among actors in the war. People like to make charts like this to illustrate the complexity of ties between relevant actors, but these don’t let us see how the particular configuration of ties can condition the organizational and military capacities of different combatants. I gave it a shot below. Solid lines are formal ties, while dotted are informal. Ties among sponsors and combatants are those of facilitation or direct support, while those among sponsors are of interstate cooperation, and those among combatants are military and political coordination. All reflect mutual recognition of the boundaries and roles of each actor involved in a tie. 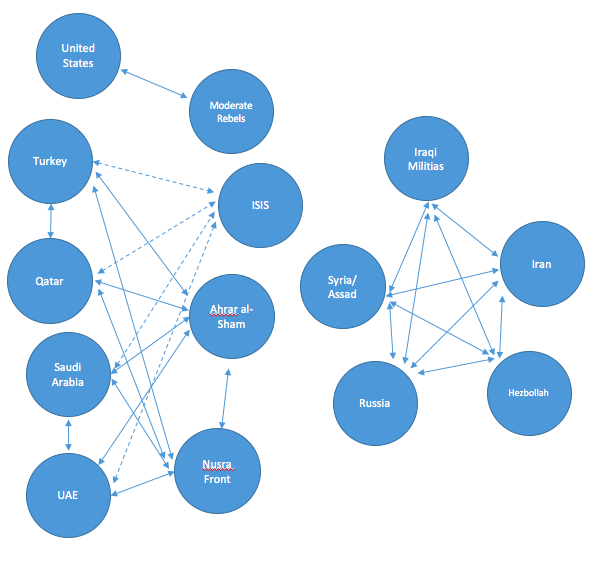 This basic representation of ties suggests that Assad’s external patrons have a more dense network: Russia, Iran, Hezbollah, and Iraqi militias all form a dense clique – cooperative ties are shared by all actors and make possible collective agreement about regional order and the roles each actor in the clique. They form a counterhegemonic bloc to rival the mostly status quo powers, including Saudi Arabia, Turkey, the Gulf States, and the United States as the hegemonic guarantor of regional security. Yet the density of that latter network has fluctuated over time due to changing ideological, sectarian, and geopolitical interests. Sunni external powers states support rebels that want to overthrow the regime, but their own rivalries have previously limited support. Since the start of the Arab Spring, Saudi Arabia and Turkey have been rivals since the latter supported the Muslim Brotherhood in Egypt and its affiliates across the region in challenging the old order, which the Saudis sought to uphold. At the same time, while the United States supports regime change in Syria, its primary threat is ISIS and seeks to develop proxies oriented toward that adversary, not Assad. Thus, in the most bitter conflict in the region, the United States and Sunni states are pursuing different foreign policies – their interests in Syria effectively promote non-cooperation and result in a more sparse external sponsor network for Sunni rebels. With no shared vision of how Syrian rebels fit into a restored regional order, external powers mostly refrained by coordinating their support for rebels from 2012 through 2014, and Assad recovered after appearing to fall in 2011. Since each external power pursued its interests through its own proxies, there was simply more of them with independent sources of support. The result as a more fractured opposition vulnerable to infighting among its factions. Although the absence of external cooperation limited over rebel coordination and cohesion, this context was best exploited by ISIS, which grew in strength based on informal ties to Sunni states and ties to non-state actors around the region (no, these are not pictured but are relevant). Meanwhile, Assad consolidated his position while backed by his more dense external sponsor network. But rebel cohesion and coordination does improve as those same external sponsors engage in cooperation. Turkey and Saudi Arabia put aside their differences once it appeared Assad might be victorious and collaborated on rebel support. Their new cooperation led to the formation of a rebel operations room known as Jaish al-Fatah, which all major rebel groups except for ISIS and the Kurds. Jaish al-Fatah successfully executed a coordinated campaign against the regime in Idlib province throughout most of this year. This campaign was the main military shift that again led to observations that Assad’s position was weakening, especially as the rebels began to threaten Assad’s main base of Alawite support in Latakia. We see this same trend – rebel military effectiveness increasing as cooperation among external powers – in the war’s current stage involving Russia’s intervention on behalf of Assad, which appears to be a temporary deepening of ties within that clique. Despite claiming to target ISIS in Syria’s eastern provinces of Raqqa and Deir-ez-Zor, the offensive has targeted the Jaish al-Fatah coalition in Idlib and rebel controlled areas in neighboring Aleppo. Russian airstrikes combined with the deployment of Syrian forces supported by Hezbollah and Iraqi militias (and all coordinated by the Iranian Quds Force) are intended to drive the rebels out of those areas and provide breathing space for the regime. Yet this increase in the robustness of external power cooperation has also occurred for the rebels, who have mostly held their own in the face of regime counteroffensives supported by Russian airpower and intelligence. Part of their battlefield success is attributed to the deployment of TOW anti-tank missiles which have been used with great success in Idlib and around Hama. Those TOW missiles are evident of increasing cooperation between the United States, Saudi Arabia, and Turkey. Only the United States can provide TOW missiles and previously refrained by supplying them because of fears that Nusra or ISIS would then obtain American arms (which has already happened). Those risks are now less relevant in a context of Russian intervention and Assad’s growing strength. The United States can’t accept a stronger Assad as an outcome of Russian intervention, and so its interest in denying Russia regional influence has finally led to covert cooperation with the nascent clique of Sunni external sponsors. In each of the conflicts phases (Assad’s stabilization, the formation of Jaish al-Fatah, and the Russian intervention), changing levels of network density among external powers appears to drive the conflict’s trajectory. Given the number of players and possible relationships, its hard to see how network density can get stronger on either side, and perhaps this suggests that the conflict is heading toward a mutually hurting stalemate. Overall, thinking about the conflict in terms of network configurations thus might tell us a lot about it. And certainly there is more to studying relationships than simply density – other properties like centrality and the presence or absence of social mechanisms like brokerage and yoking are especially relevant since they bring ideology into our explanation in a worthy way. Research that continues this relational focus will be especially insightful.